After the release of new filters on selfie, snapchat released a new feature in the latest update of October 2015 on Snapchat version 9.18.1.0. 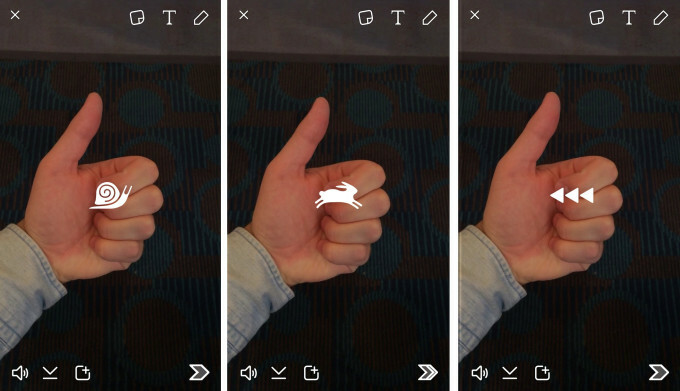 In this latest update, you can create slow motion video, fast forward, and rewind on snapchat. To be able to use this new video filters, make sure you have updated your snapchat app, this feature are avaliable for iPhone and Android, or you can also update it by using the apk file. After you installed or updated to the latest snapchat version, run the snapchat app and choose which camera you want to use, this filters are works for both rear and front camera. Slow motion: this filter will slowing down the speed of your video, it is very suitable for girls with beautiful long hair, let them see how your stunning hair move in slow motion. Fast forward: this is the opposite of slow motion, you can speed up the video of you walking down the street and make it like you are running, just like in chaplin’s movies, i mean everything looks ridiculous in fast forward video. Rewind: just a normal video with no speed up or slowing down the video, except it’s rewind or backward the video, this filter will allow you to do some kind like a magic trick, like throwing a hammer and apply this filter to look like Thor catching his hammer. Besides new video filters, in the latest update of snapchat, they add 3D menu for iPhone 6 and iPhone 6s users, that make it easier to send a chat or add a new friend from home screen. The new snapchat’s video filter to make a slow motion, fast-forward and rewind is pretty fun, enjoy it and share to your friends to make some fun together.